Who else is interested in learning more about Tyler Henry, the psychic “superstar” earning huge rave reviews on the E networks new blockbuster…..The Hollywood Medium. In just the last few episodes…..Tyler has read for celebrities like Amber Rose (who said NO to more rappers for boyfriends..:-) John Salley, Tom Arnold, “Snookie” from the Jersey shore, Monica Sutton and far more. Tyler claims to be a medical intuitive, a psychic and a medium…and the show seems to validate his extraordinary intuitive abilities with just about every session. The truth is, Tyler just feels genuine, and authentic and that air of authenticity comes through, along with his obvious humility in every session. So how do you make an appointment to see the Hollywood Medium in person? For that, I think you’re going to have to get in line! 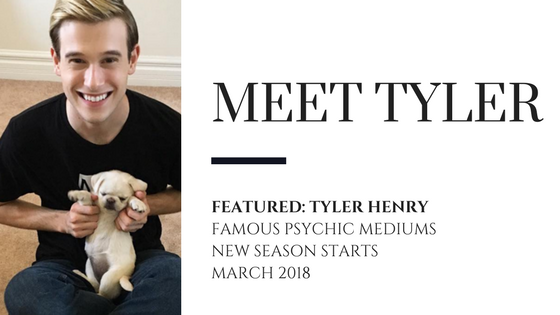 We’ve heard that Tyler is overwhelmed with offers for private readings and requests for all sorts, and not surprisingly…it’s going to be difficult to see him in person in the immediate future…. unless you’re pretty well connected. Check out Tyler’s website here for private appointment information, or connect with him on social media here. So what do OTHER famous psychics and mediums think of Tyler Henry? Check out some of the really nice things what another superstar TV medium, John Edward…. had to say at the link below! Psychic John Edward just took to Twitter to give his thoughts on the star of E!’sHollywood Medium With Tyler Henry. I so much want Tyler to reach my daughter, died tragically, a car flew 10 feet and landed on her, she was only 23 at the time was at work on lunch, so there was No Goodbye.. I live in the Pocono Mt. Which is 2 hrs out of NY.I want more then anything to talk to my daughter again. If we can help you in any way – please send us an email and I’m happy to point you in the right direction, if we can. Does Tyler Henry read only for celebrities? Is it possible for him to do a reading over the phone and what would he charge? I am a senior citizen on a fixed income but I’ve had something happen in my life that I really would like to have an answer and closure. Thank you so much. Hello, I love to watch and enjoying your TV readings. I live in NJ and like to know if you do reading trough on the phone? If yes, how much you charge? I would like to make an appointment with Tyler Henry can someone please contact me back? Does Tyler do readings over the phone? I’d be interested in the cost….. I want to know how much you charge for a reading?? 1- how much does Tyler charge for a reading ? 2- how long is it ? 3- is it better in person or over the Phone ? Would love a reading….I NEED IT! I’m drowning. I truly believe you are a truly blessed person. I hope your able to help a lot of people.